You can never quite get out the last of the toothpaste can you? This is why people just end up squeezing from the top, but if you squeeze from the bottom you get a lot more out of each tube, and it's a much more ergonomic and practical way to get toothpaste. But top-squeezers don't understand this, and nor do they care, which frustrates the bottom-squeezers. Brix overheard a top-squeezer saying "If only bottom-squeezing was easier......."
The next day, Tim Hognor (an infamous top-squeezer) embraced their ingenius solution to the leftover remnants of toothpaste tubes, and now he's a certified bottom-squeezer! 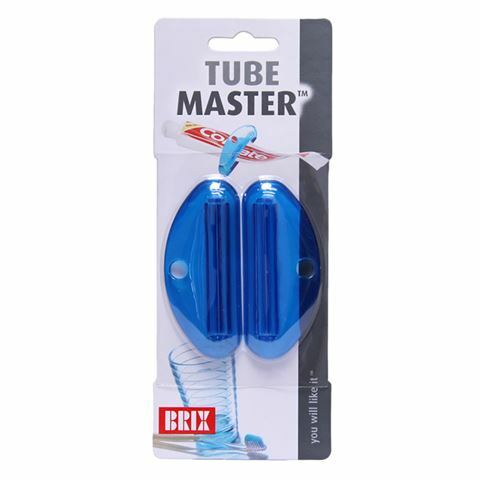 All you have to do is slip a TubeMaster on the end of your toothpaste tube, and graually roll it up as you use more toothpaste! It's super effective, and the bright colours are fun, allowing for personalisation. Now we can all be bottom-squeezers! Comes as a set of two. Slip device over a toothpaste tube and roll it up for maximum toothpaste use. Fits most standard toothpaste tubes.